This week: FREE MIDNIGHT BUFFET! Fantastic Dance floor, FREE Parking! With the best of Salsa, Merengue, Bachata and Cha Cha served to you by the best Latin DJ in Cincinnati - the legendary DJ Rudy Alvarez. Radio La Mega is organizing "Mega Concierto" on Sunday, May 20, and MidwestLatino is one of the sponsors. Sponsored by DonQ Rum from Puerto Rico! So come to LUNAR Lounge, to the BEST Opening Party EVER! - With DonQ Rum sampling! - With TWO Dance Floors!!!! - With the BEST music in Cincinnati! - More details are coming soon! The date is set for Saturday, May 19, and everybody is invited to participate and support. So please spread the word to all international groups and let us know if you or your group would like to participate. We plan to make the 2012 AWL International Festival the best ever!!!! An opportunity for you to meet other artists and learn about businesses, art clubs and educational institutions that cater to artists. Come, mix and mingle with artists in an artsy environment! This Thursday, March 15th, @ Lunar we're doing a photo shoot for a local newspaper! Bring a group of friends and we'll take a picture of you. The best picture will be published the following week! - FREE VIP ticket for Cincinnati's hottest Saturday Party - the party @ Lunar! - FREE ticket for Friday's Salsa @ Cactus Pear! $3 Domestic beers and $4 Well and call liquors and $5 Mojitos! 10:0 PM the best of Reggaeton, Merengue, Bachata, Samba, and Salsa. And of course, with the best Latin DJs in Cincinnati - DJ Rudy, and DJ Jose Bonilla (El Rumbero) ! The Salsa events are getting better and better! Join us this week for more fun and more dancing! It's been a while, but Latino Happy Hours are BACK! This Thursday at LUNAR Lounge (435 Elm Street, Cincinnati, OH). With Live FLAMENCO music by Jorge Wojtas! And live TANGO performance by Patricia Paz! Wines from Argentina and Chile. Dance performance by Colombia Viva! Another great dancing week for our Salsa friends! We would like to invite our Salsa friends to a dinner! Once a month, on the 1st Friday, we'll have a group dinner at Cactus Pear. We'll have a private room and a special price $10 for the dinner. This will be a nice opportunity to get to know each other and meet other people as well. Limited number of seats, please contact us directly if you're coming and would like to reserve a seat. Or call 513-791-4424 for reservation. Salsa Party afterwards till 2 AM with DJ Rudy! Patricia Paz Tango and Tango del Barrio Tango are proud to present an evening of Argentine tango to benefit MyCincinnati, Music for Youth in Cincinnati, a free music program for elementary school students in Price Hill. Organized in partnership with the Cincinnati Opera, concert:nova, LULAC Cincinnati, and Midwestlatino. 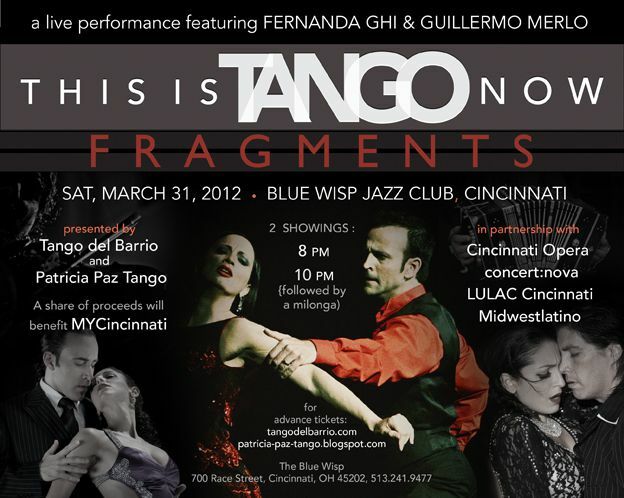 Fernanda Ghi & Guillermo Merlo, one of the most prominent couples in the world of Argentine tango, return to Cincinnati on Saturday, March 31 with two performances at the Blue Wisp Jazz Club. Created with Alfredo Minetti and comprised of excerpts from This Is Tango Now: Indentidad, their exciting presentation includes a cast of 10 dancers and musicians and features compositions by Pugliese and Piazolla. As always we had a lot of Salsa, Bachata, Reggaeton, and a LOT of FUN! Don't miss this week's Latin Mix Party @ LUNAR! The BIG OPENING of Salsa Wednesdays @ The PENGUIN (former Havana Martini Club, 5th St. between Vine and Race) was a BLAST!